Bored Yak: What's That? An Event At Meadows!? What's That? An Event At Meadows!? Still don't have plans for New Year's Eve? You could do worse than stopping by Mt. Hood Meadows. First of all, remember the feet of snow in the last couple days? Well, they're running the lifts until midnight, so you can make sure Two Bowl is extra mogul-ed out. If you get tired at any point and you're of-age, they have live music in the Vertical bar with The Essentials. Apparently who they are "the top rated dance party band on the west coast" (their words, not mine). But wait, there's more! Just because you're young doesn't mean you have to totally miss out on an otherwise over-21 holiday. Meadows is hosting a rail jam in the Shipyard park. The name of the game seems to be 'free stuff.' For the crowd, for the groms, for people who like to wander and watch fireworks and maybe even for whoever wins the "slow-down throw-down." Seriosly, hoo wrights thiz stoughf? 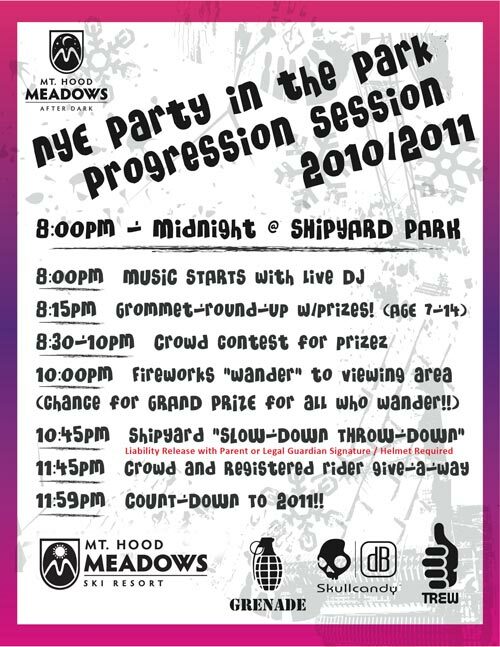 If you've got mad rail skills and no New Year agenda, assemble your crew and get to Meadows. Leave without prizes and you only have yourself to blame.